The new releases from sister wineries LaStella and Le Vieux Pin offer a glimpse of the last three vintages in the Okanagan. The 2012 vintage was very good. The 2013 challenged growers but those who rose to the challenge made good wines. And 2014? For what I hear from the industry, it may have been the best vintage in 20 years. He continues by describing 2013 as almost two vintages. In September that year, midway through the harvest, it rained in the Okanagan and Similkameen, which is quite unusual for that month. Grapes picked before the rain were generally healthy. The rain, which lasted several days, caused mould and rot among grapes with tight bunches (the Pinot family and Viognier) – especially those grapes already damaged by the unbelievable wasp explosion of that season. But those producers who escaped rot then had a long warm autumn in which to finish ripening fruit. “2014 was a really interesting year,” Rasoul says. It was one of warmest, driest years in a long time. Even the nights were warmer than usual. Severine Pinte-Kosaka, the French-trained winemaker at these wineries, said it reminded her of the south of France. Having to pick earlier was not a disadvantage. The grapes generally ripened early and the alcohol in some of the finished wines is more moderate – 12% and 13% in the case of the rosé wines from these wineries. That certainly promotes the drinkability of the wines. 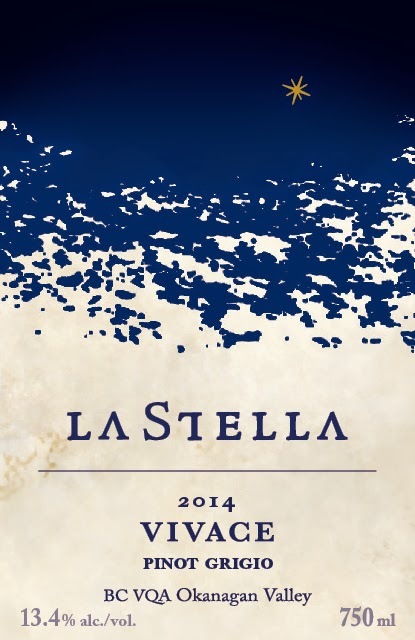 LaStella Vivace Pinot Grigio 2014 ($24.90 f0r 771 cases). This expressive wine begins with aromas of spice, pears and citrus. On the palate, there are generous flavours of apple, pear and melon. The wine has a dry finish and good spine of minerality. 90. 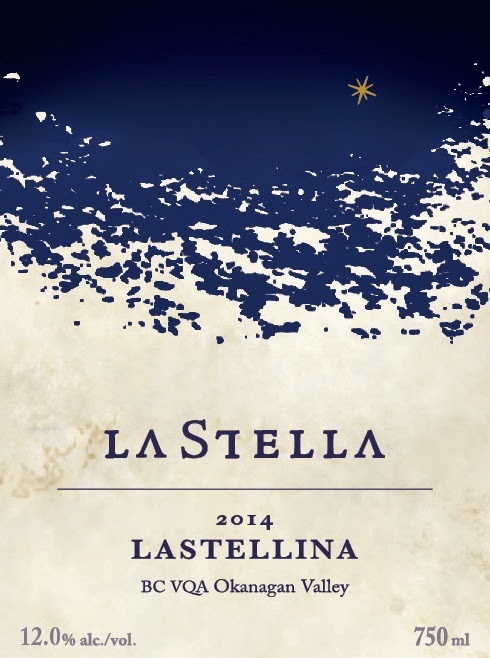 LaStella Lastellino Rosé ($22.90 for 421 cases). This rosé is approximately 50% Merlot and 40% Cabernet Franc, which were pressed together. The remainder is Sangiovese, bled from the tank. Salmon pink in colour, it has a juice texture with the slightest hint of sweetness. It has aromas and flavours of Bing cherries. Luscious on the palate, the wine has a lingering finish. 90. 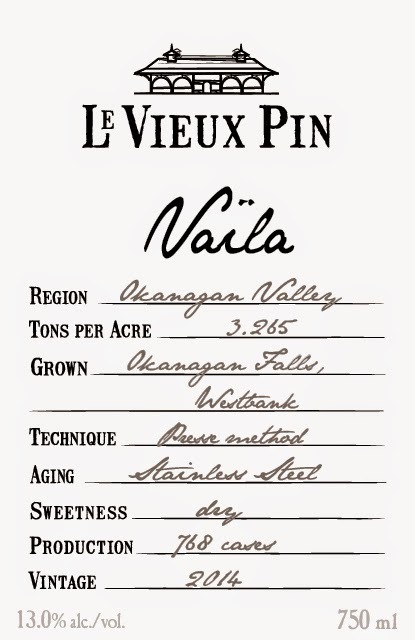 Le Vieux Pin Vaïla Rosé 2014 ($24.90 for 768 cases). This delicious wine is made entirely with Pinot Noir pressed for rosé; it is not a saignée rosé. The wine begins with appealing strawberry aromas leading to flavours of rhubarb and pink grapefruit. The wine has a refreshing dry, tangy finish. 90. 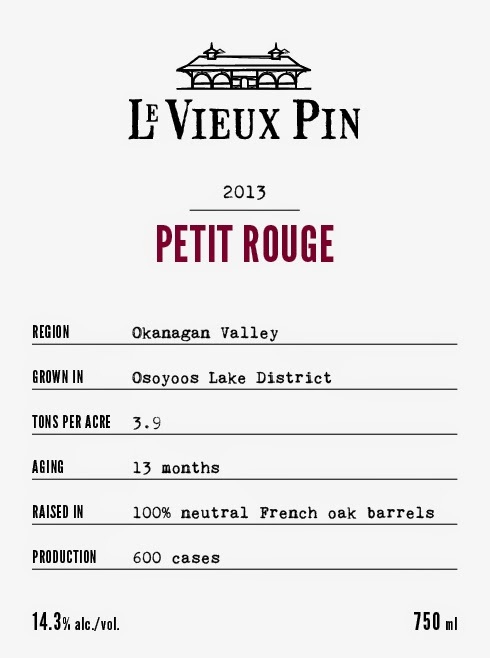 Le Vieux Pin Petit Rouge 2013 ($24 for 600 cases). This is primarily Merlot with a little Syrah to fill out the blend. The wine begins with demonstrative fruit aromas – black currant, blackberry and cherry. These are echoed on the palate and in the spicy finish. The soft ripe tannins make this an approachable wine for drinking now; but it will cellar well for a few years. 90. 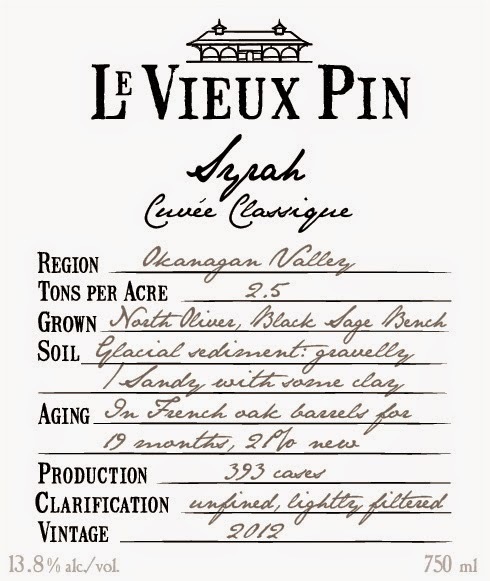 Le Vieux Pin Syrah Cuvée Classique 2012 ($49 for 393 cases). This dark brooding Syrah begins with aromas of plum and black pepper. It has smoky flavours of black olives and plums with an earthy note on the finish. The minerality gives this wine a muscular and age-worthy structure. 92-94. 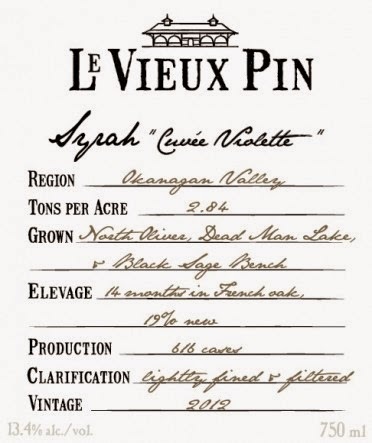 Le Vieux Pin Syrah “Cuvée Violette” 2013 ($29 for 891 cases). The wine begins with aromas of black cherry delicately accented with white pepper. On the palate, there are earthy flavours, including plum, black cherry and pepper. The wine aged 14 months in French oak (none of it new). The structure is firm enough to support a few years of cellaring. 91. 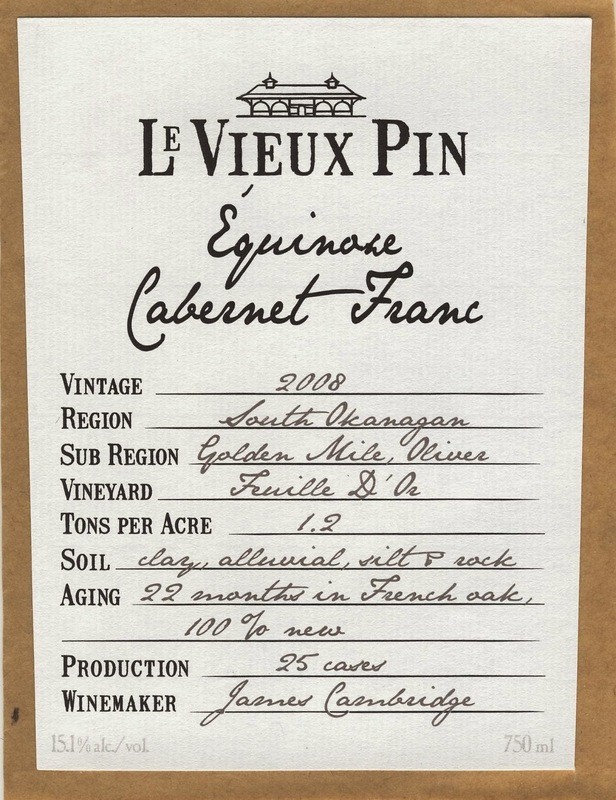 Le Vieux Pin Équinoxe Cabernet Franc 2012 ($149 for 25 cases). Not yet released, this powerful wine could pass for a Barolo. The immense concentration of texture and flavours results from cropping the vines at 8/10 of a ton an acre and from aging the wine 26 months in French oak. The wine begins with aromas of black cherry, blackberry and black currants. On the palate, the texture is bold, with flavours of black currant, dark chocolate, coffee and spice. 95. Don and Elaine Triggs, and Sara, their daughter, launched Culmina Family Estate Winery with wines grown in the challenging 2011 vintage. As good as the debut wines were, one wondered what Culmina would do with a more typical Okanagan vintage. The answer: even better wines. Don has a chart tracking the growing degree days in his Arise vineyard (south of Oliver) in the last four vintages. “In 2011, we had about 1,350 degree days on Arise compared with 1,65o in 2014,” he says. “A 300 degree day change.” Both 2012 and 2013 also were warmer years, although not quite as warm as 2014. The bottom line: wines made in 2012, 2013 and 2014 all show more power and intensity. This spring, Don has been hosting tastings, mostly for sommeliers, to prime the sales when the wines are released. I have also had a chance to taste the wines and they are terrific. The good news is that this year’s releases include a fine Meritage blend for $25, an entry-level red for those who find Culmina’s $44 red, Hypotheses, beyond their budget. The bad news is that the 285 cases of Unicus 2014, the white made with Grüner Veltliner, is almost entirely on allocation to restaurants. “The issue is how are we going to find more terroir like Margaret’s Bench,” Don says, referring to high altitude vineyard where he planted the Okanagan’s first Grüner Veltliner. This is the major white variety grown in Austria. The first release of Unicus, from the 2013 vintage, was only 60 cases. With the vineyard reaching full production in 2014, Culmina expected a more substantial bump in volume. But what a wine! Unicus 2014 ($27) begins with floral and citrus aromas with a hint of white pepper. It delivers a fruit basket of flavour, including lime and guava. The finish of this dry wine refuses to quit. 92. Decora 2014 ($23 for 800 cases) is the winery’s Riesling. It is a racy, exciting, bone-dry wine that will be offered both to restaurants and to wine stores. It begins with floral and citrus aromas that lead to flavours of lime and lemon with a spine of minerality. While this still shows all the primary fruit aromas and flavours of a young Riesling, it will blossom over the next several years to show that complexity that Riesling fans call petrol. 91. Dilemma 2012 ($33 for 160 cases). This is Culmina’s Chardonnay. It was released in January and is almost sold out. The style seems Burgundian, perhaps because winemaker Pascal Madevon’s grandfather was from Burgundy. The wine has toasty notes of expensive French oak on the nose and on the palate, along with buttery notes and rich tangerine flavours. 92. Saignée 2014 ($25 for 600 cases) is Culmina’s dry, food-friendly rosé. The wine is made by bleeding some juice from newly-pressed reds: four tanks of Merlot, two each of Cabernet Sauvignon and Cabernet Franc. A salmon-pink wine, it has aromas and flavours of strawberry, rhubarb and cranberry. The wine has good weight on the palate and a very long finish. 91. This is Culmina’s second rosé. This vintage, which will be available in wine stores, comes in a brilliant package. Culmina is using tall, crystal-clear bottles produced by Saber Glass in Europe, with glass stopper closures. New this year is R&D Red Blend 2013 by Culmina ($25 for 800 cases). This is a meritage anchored around Merlot and made to be an approachable red for earlier consumption than Hypothesis. This wine, to be released in June, shows that 2013 was a strong vintage. The wine begins with aromas of vanilla, black cherry and black currant. It is generous on the palate with flavours of black currant, dark chocolate and coffee. The texture is firm enough that the wine benefits from decanting; it will also cellar well. 91. The wine has an intriguing label reproducing a Triggs family photograph of eleven-year-old twin brothers, Ron and Don Triggs. Ron is now a retired sales executive and a passionate fisherman. “R&D is also a reflection of all the research and development we did in the vineyard,” Don says. Hypothesis 2012 ($44 for 2,200 cases) is the second release of Culmina’s flagship red. This is 57% Merlot, 24% Cabernet Sauvignon, and 17% Cabernet Franc. This is a wine built to age a decade or so but, with time in a decanter, it can already be appreciated. It has aromas of vanilla and black cherry. The texture is concentrated and almost chewy, with flavours of black currant, black cherry, dark chocolate, coffee and cedar. The point score depends on how long you age the wine. 91-94. The thirteen wineries that make up the Okanagan Falls Winery Association recently showcased their wines in Vancouver, to considerable acclaim from those attending. This is an association which includes some of British Columbia’s longest producing wineries (Blue Mountain and Wild Goose) along with promising recent entries (Liquidity and Synchromesh). What links the wineries geographically is that their vineyards either overlook Skaha Lake or are clustered around the town of Okanagan Falls. This is one of the oldest towns in the south Okanagan. It is a community so modest that wine tourists have been in the habit of driving through, perhaps just with a stop at Tickleberry’s for ice cream. In recent years, however, the wineries have begun offering attractions to keep the wine tourists there. Painted Rock Winery has one of the most elegant tasting rooms in the valley. Liquidity and Wild Goose both have opened restaurants with spectacular food. See Ya Later Ranch has always had a spectacular view from the terrace beside the heritage house serving as a wine shop. I suspect there are more attractions coming. Development in Okanagan Falls has been restricted by an inadequate sewage treatment system. I believe that has now been addressed. As usual, I could get around to every table. I missed the excellent wines at Meyer Family Vineyards, Painted Rock Estate Winery and Stag’s Hollow Winery. But here are notes on the rest of the wines I did taste. There were a number of 2014 wines. That promises to be a very good vintage, the Okanagan’s third strong vintage in a row. Blasted Church Vineyards opened in 2000 as Prpich Hills. After Chris and Evelyn Campbell took it over two years later, the name was changed. The name change and the brilliant caricature labels drew attention to the winery and the wines have held that interest. Blasted Church 2014 Sauvignon Blanc ($19.50). This is a delicious white with lots of tropical fruit aromas and flavours, along with notes of herbs and gooseberry. The finish is tangy and refreshing. 90. Blasted Church Pinot Gris 2013 ($20.50 for 2,500 cases). This is a crisp white with flavours of pear, citrus and apple and a hint of anise on the finish. This wine is almost sold out. 90. Blasted Church Cabernet Sauvignon Merlot 2011 ($26.50 for 2,721 cases). This is a fairly complex blend: Cabernet Sauvignon (53%) Merlot (38%) Malbec (5.5%) Syrah (2.1%) Petit Verdot (1.4%). There is lots of black cherry and cassis in the aroma and on the palate, with notes of leather and cedar on the finish. 90. Blasted Church Nothing Sacred 2010 ($41). The winery is just releasing the 2011 vintage but you might be able to find 2010 in wine stores. This is a reserve Meritage that winery began making in 2007. Production typically is just 200 cases. This is a delicious wine, with flavours of plum, black cherry, cassis and a hint of mocha. 91. Blue Mountain Vineyard and Cellars. The Mavety family has been farming its Okanagan Falls vineyard since 1972. The winery, opened in 1992, is arguably the anchor tenant in the Okanagan Falls wine region, now that it has begun to open its wine shop from spring through autumn. Blue Mountain Chardonnay 2013 ($20.90). There is often an element of restraint in the elegant Blue Mountain style – there is never too much oak, never too much malo, never too much alcohol. This wine is bright flavours of citrus and apples with a crisp finish. 90. Blue Mountain Pinot Noir 2013 ($25). The sad news is that this wine is sold out at the winery. No wonder. It is delicious, with a toasty note and cherry aromas on the nose, leading to flavours of cherry and raspberry. The texture is silky. This is an elegant and pretty wine. 90. Blue Mountain Brut NV ($23.90). Arguably, this is the best value among the Okanagan’s sparkling wines. Toasty and bready on the nose, the wine has appealing hints of apples on the palate. The lively bubbles give it a creamy texture on the mid-palate; but the wine finishes dry. 90. Blue Mountain Brut Rosé 2010 ($32.90). The Blue Mountain Rosé usually sells out in a flash. It is a lovely sparking wine, appealing to the eye and, with delightful strawberry and raspberry notes, satisfying on the palate. 91. Krāzē Legz Vineyard and Winery, the first winery in Kaleden, opened in 2010. Gerry Thygesen, who runs the winery with his wife, Sue, is the current president of the Okanagan Falls Winery Association. Since last year, the winery has released its wines under a new label, Skaha Vineyard. Skaha Vineyard Pinot Blanc 2014 ($18.95). Crisp and refreshing, this wine’s flavours of apples and melons just explode on the palate. 90. Skaha Vineyard Unoaked Chardonnay 2014 ($19.95). Like the Pinot Blanc, the flavours have a laser-like focus and a pristine freshness. This wine has notes of apple and citrus in the aroma and on the palate. 91. Skaha Vineyard Cabernet Franc 2012 ($25.85). This wine was aged 20 months in French oak, which accounts for the polished texture. The wine has aromas of blackberry and mocha leading to spicy, brambleberry flavours enhanced with a touch of vanilla. 91. 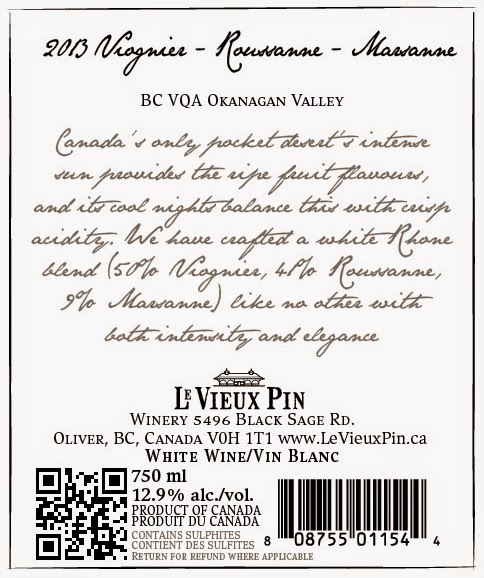 Skaha Vineyard Impulsion Reserve 2012 ($23.85). This is a blend of 60% Merlot, 40% Cabernet Franc. It also spent 2o months in oak. The wine has aromas and flavours of black currants, cherries and vanilla with notes of mocha and coffee on the finish. The long ripe tannins add to a generous texture and finish. 91. Liquidity Wines opened in 2012. The winery has an elegant wine shop and bistro, with a shaded patio on which one could doze through an afternoon with a nice wine in the ice bucket. Liquidity Pinot Gris 2014 ($19.90). The wine has aromas and flavours of pear and apple with a backbone of minerality. 89. Liquidity Chardonnay 2012 ($23.90). This lightly oaked Chardonnay has aromas and flavours of citrus, with buttery and spicy tones. 90. Liquidity Merlot 2012 ($25.90). This is a tasty Merlot, supple on the palate with flavours of black cherry and black currants. 89. Noble Ridge Vineyard and Winery has now been open 10 years. Jim and Leslie D’Andrea are Calgarians but in transition to the Okanagan. Leslie now lives in the new house on the property while Jim splits his time between a Calgary law office and the vineyard. Phil Soo, a consulting winemaker, makes their wines. Noble Ridge Pinot Grigio 2013 ($19.90). This winery is one of the few in the Okanagan still using the Italian varietal name rather than the French. The wine tastes good in either language. This has aromas and flavours of pear and apples, with spice and herbs on the finish. 90. Noble Ridge Reserve Chardonnay 2011 ($29.90). This is a big, mouth-filling Chardonnay with flavours of tangerine, ripe apples and the nutty/buttery/ spicy flavours of well-integrated oak. 90. Noble Ridge Reserve Pinot Noir 2012 ($29.90). Big and bold best describes the Noble Ridge Pinot Noir, always a powerful wine. It has aromas and flavours of cherry and strawberry, with earthy chocolate notes on the finish. 91. Noble Ridge Reserve Meritage 2012 ($29.90). The specifications are not on line but this is almost certainly a blend of Merlot and Cabernet Sauvignon with a judicious amount of barrel aging. There is a touch of oak in the aroma. On the palate, there is a rich basket of flavours, including black cherry, vanilla, black currant, dark chocolate and espresso coffee. 91. Pentâge Winery, which opened in 2003, is actually within the southern limits of Penticton but it is a better marketing fit with the Okanagan Falls wineries and with the Naramata group. Pentâge Roussanne Marsanne Viognier 2011 ($27). This wine shows intriguing tension on the palate, with flavours of stone fruit and with a spine of minerals. With a dry finish, it is a very good Rhone blend. 90. Pentâge Sauvignon Blanc Sémillon 2012 ($21). This is a complex dry white, beginning with herbal aromas. On the palate, there are herbal and nutty flavours, along with notes of lime. 90. Pentâge Rosé 2013 ($NA). This is a Zinfandel rosé for serious rosé drinkers. The colour is deep, the weight is good and the finish is dry. It is packed with flavours of plum, cherry and blackberry. 91. Pentâge Gamay 2013 ($21). Another taster in the room directed me to this wine. Recommendations are always good. This is a structured red with a delicious core of earthy, cherry flavours. 90. Pentâge 2010 ($30). This is a blend of 39% Cabernet Sauvignon, 27% Cabernet Franc, 17% Merlot, 13% Petit Verdot, 3% Syrah and 1% Gamay. The chewy ripe tannins give it a generous texture there are flavours of black cherry, dark chocolate and vanilla. 91. See Ya Later Ranch has been opened under several owners and names since 1986. The current name celebrates the legend that a long-time ago owner of the property was abandoned by his wife, who left a note saying “see ya later”. The more prosaic story is that he signed his letters that way. Whatever the truth, the wines are good and surprisingly inexpensive. See Ya Later Ranch Gewürztraminer 2014 ($14). This vineyard here is said to be North American’s biggest single block of Gewürztraminer. True or not, it is one of the best. This is an appealing wine with aromas and flavours of spicy grapefruit. A dash of Ehrenfelser in the blend adds flesh and tropical fruit flavours. 90. See Ya Later Ranch Chardonnay 2014 ($15). The winery is practically giving away a very fine barrel-fermented Chardonnay. The wine has aromas of apple and pear, with a hint of cloves to light up the mid-palate. The finish is fresh and crisp. 91. See Ya Later Ranch Ping 2012 ($22). This is a blend of 55% Merlot, 27% Cabernet Sauvignon, and 18% Cabernet Franc, aged 19 months in French (60%) and American oak barrels. A generously textured wine, it begins with aromas of plums and cherries which are echoed in the flavours, along with vanilla and espresso coffee. 90. Synchromesh Wines, which opened in 2011, has developed a reputation for its Riesling table wines. At the recent show, three single vineyard Rieslings from the Naramata Bench were offered in addition to the winery’s budget Riesling. Synchromesh Riesling 2014 ($17). This is the winery’s 1,000-case entry level Riesling that is also available in kegs for restaurants. It is a tangy, refreshing wine with lime and lemon aromas and flavours. It is balanced to finish dry but is not austere. 89. Synchromesh Thorny Vines Riesling 2014 ($22). This wine offers intense aromas and flavours of lemon and lime, with lively acidity and a long finish. 90. Synchromesh Bob Hancock Vineyard Riesling 2014 ($22). This is another wine with vibrant acidity, flavours of lime and lemon and a nice spine of minerality. 91. Synchromesh Four Shadows Riesling 2014 ($22). This wine is somewhat restrained on the nose, likely because it is still getting over bottle shock. It has appealing flavours of lime and grapefruit with good minerality. 90. Synchromesh Cachola Vineyard Cabernet Franc 2013 ($19). This is a Cabernet Franc for Pinot Noir lovers, with its light color, silky tannins and flavours of strawberry and blackberry. The wine is appealing even though it is hardly a mainstream Cabernet Franc. 88. Synchromesh Tertre Rouge 2012 ($39.90). This is a 50/50 blend of Cabernet Franc and Merlot. Firm on the palate, the wine has flavours of plum, black currant, coffee and dark chocolate. It has a core brimming with fruit that will develop superbly in bottle over the next three years. 90-92. Topshelf Winery is one of two wineries in Kaleden. It also opened in 2011. The labels are all built around hockey jargon. Does it get any more Canadian? Topshelf Slapshot Chardonnay 2013 ($18). This is an unoaked Chardonnay. The wine is crisp and refreshing with flavours of apples and melons. 88. Topshelf Point Shot Pinot Gris 2013 $18). This wine is packed with flavours – apple, citrus and pear – with good minerality and a crisp dry finish. 89. Topshelf Over The Top Merlot 2013 ($20). Here is a juicy and approachable wine, with jammy flavours of black currant and black cherry. 89. Topshelf Hat Trick Meritage 2013 ($33). This is a blend of Cabernet Franc, Malbec and Merlot. Dark in colour and firm in texture, it has aromas of red fruits with a hint of violets. On the palate, there are spicy flavours of black currant, coffee and chocolate. 90. Wild Goose Vineyards opened in 1990. At the time, a government official told them they would be lucky to sell 1,000 cases. This has become of the Okanagan’s best and most successful wineries, both for the quality of the wines and for the warm welcome visitors always get from the Kruger family, the owners. Wild Goose Pinot Gris 2013 ($18). Pinot Gris is one of those whites that tastes better a year after release. This wine has rich flavours of peach and ripe apples. 89. Wild Goose Gewürztraminer 2013 ($18.50). The same goes for an extra year of bottle age for Goo. The spice and grapefruit aromas and flavours are intense and the wine has a long finish. 91. Wild Goose Red Horizon Meritage 2012 ($22). 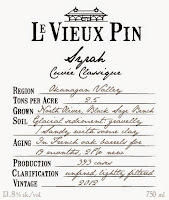 This is the second vintage of the winery’s Merlot-anchored Bordeaux blend. It begins with aromas of black cherry, cassis and vanilla, leading to flavours of cherries and black currants. The long, ripe tannins give this wine a rich and satisfying texture. 90. The death of Jurgen Gothe on April 9, 2015, is such a loss to all of us who experienced his generosity, his erudition and his wonderful personality. Born in Berlin in 1944, he grew up on the Prairies. When he became bored in high school, he decided he could learn what he needed to know on his own. He dropped out of school and initially, supported himself by selling magazine subscriptions and working in a gas station in Carberry, Manitoba. Few self-taught individuals have accomplished as much. Blessed with a voice of intimate richness, he started as a broadcaster in private radio. That led to the CBC in 1985 to name him host on Radio Two of a classical music program called DiscDrive. It was on the air nationally five days a week until 2008. Its cancellation was part of the CBC’s unfortunate decision to dump most of its classical music programming. His refreshing approach, salted with quirky humour, made music accessible to a large audience. In his highly rated three-hour time slot, he programmed not just classical music (I recall him being a particular fan of Mozart) but also jazz and bluegrass and whatever else appealed to his eclectic taste. I would think that Jurgen will have approved of the CBC’s recent decision to give tenor Ben Heppner a classical music program on Radio Two. 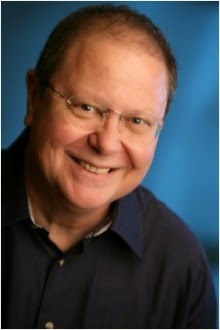 Heppner has the same eclectic taste, wit and intellectual curiosity that distinguished DiscDrive over 23 years. Jurgen and I took up wine writing about the same time, perhaps 35 years ago. We also met frequently at wine tastings and at wine judgings. He had a fine palate. Most recently, he was the wine columnist for the Georgia Straight from 1997 to 2014. His wine reviews were like his radio work: entertaining, accessible and generous. In the interest of full disclosure, I can tell you that Jurgen reviewed most of my books. The reviews were always positive. While I like to think that is because the books were good, I think it is more that Jurgen just had a positive view on life. I never remember hearing a negative comment from him about anyone. In 1994, I wrote the first edition of The Wineries of British Columbia. With some temerity, I asked Jurgen to write a foreword. It was one of the best essays in the book. “Being a wine writer is, in this country at least, still somewhat suspect,” he wrote. “For one thing, there’s all that free wine. ‘Bet you get a lot of good stuff free, eh?’ people nudge-nudge at cocktail parties. The wine writer chokes on his chardonnay. Thanks to the byzantine rules and regs of our ten different-as-can-be provincial bodies of control, thanks to the still-lingering fear that wine may yet be the handiwork of the forces of darkness, the freebies are as scarce as affordable burgundy. I am glad that Jurgen experienced the positive changes that were just beginning when that was written. Samples of good wine now arrive with such regularity that every wine writer conscripts friends and neighbours to finish the samples. I am sure Jurgen was no different. As Jurgen observed then … and it remains true … we don’t write about wine expecting to get rich. “I know most of the wine writers, real and soi-disant, in the land. There isn’t a one of us who makes enough from the fruits of these labours to keep a beach cottage in hydro,” he wrote. “It’s similar to what musicians tell you. You can’t make a living playing Bach. You can’t make a living writing about wine in Canada. Yet. Or so I like to think. “For years I was the wine columnist for a hundred-and-something-year-old daily newspaper in these parts. I am too embarrassed to tell you in public what they paid me. But I did get one raise in ten years of never missing a Sunday: six bucks per column! As a sartorially challenged Canadian sports commentator says: you gotta love it! “And really, there’s the rub. Like John Schreiner, I have been an enthusiast of and periodic apologist for British Columbia wines for what seems to be a lifetime; since long before it was fashionable – or even safe – to do so. The foreword turned out to be a rave review. He wrote at least three books of which I am aware. There was a 1990 volume called Good Gothe! The Enthusiasms of an Airwave Connoisseur. His 1995 book of recipes, Some Acquired Tastes: A Recipe Album was cited in an academic paper reviewing cookbooks by B.C. authors. The most recent, I believe, was his 2005 volume of recipes, DiscCookery: The DiscDrive 20th Anniversary Cookbook published by Whitecap. The recipes are, as you would expect from Jurgen, practical and accessible. He even pairs them with wine and with music to listen to while cooking. You can find them on Amazon and other used book sites. It has been a favourite around our house for years. Thank you for that, Jurgen, and for everything else. Even though the winery has been producing since 1986, CedarCreek Estate Winery still had several firsts in its spring release wines this year. These include Platinum, or reserve quality, single vineyard reds from its Desert Ridge Vineyard, just north of Osoyoos. The property once was a renowned zucca melon farm. Senator Ross Fitzpatrick, CedarCreek’s founder, decided in 2001 the Kelowna-based winery needed a vineyard well-suited to Bordeaux red varieties. He acquired six hectares that year and an adjoining 3.2 hectares the following year, calling it Desert Ridge Vineyard. Merlot vines from France were planted in 2002. The additional Bordeaux reds varieties --Cabernet Sauvignon, Cabernet Franc and Malbec – were planted in 2003. This forgotten vegetable, a giant bottle gourd, was a major crop in both the south Okanagan and the Similkameen Valleys for perhaps twenty years before being displaced by orchards and vineyards. The zucca melon belongs to the same vegetable family as cucumbers, squash and zucchini. The seeds, it is believed, came to North America from Sicily, brought by immigrants whose families had cultivated the zucca for years. It arrived in southern British Columbia about 1938, to be embraced with a passion because the fruit grows as prodigiously as the zucchini but with a big difference: mature zuccas are giants averaging sixty to one hundred pounds each. Neutral in taste, the melon’s flesh is a chameleon assuming whatever flavour is added in the processing. During World War II, the zucca served as the base for simulated strawberry jams and other faux confections. The melon disappeared from cultivation so quickly after 1950 that the Grist Mill at Keremeos could find seeds only in California when it added zucca to its heritage garden in 1990. Anyone tasting the single vineyard wines from Desert Ridge will be forever grateful that the senator found a higher use for this terroir. And there is one more first among the current releases: the winery’s first Estate Meritage. The wine’s flavours have been turbocharged by adding 20% Malbec to the blend. Here are notes on the wines from one of CedarCreek’s best spring releases. CedarCreek Merlot Cabernet 2012 ($19.95 for 3,976 cases). This wine, which was aged 21 months in French oak, is a complex blend of 61% Merlot, 25% Cabernet Sauvignon, 8% Cabernet Franc and 6% Malbec. The winery says the Malbec is a “not-so-little, little thing.” Another premium Okanagan winery refers to Malbec as a secret weapon because of its impact on aromas and flavours. CedarCreek draws attention to the hint of violets in the aroma. I also find chocolate, black cherry and vanilla. The wine delivers flavours of red fruit with a spiciness recalling good fruitcake. The wine has long ripe tannins. 89. CedarCreek Meritage 2012 ($21.69 for 1,425 cases). This is a blend of 46% Merlot, 21% Cabernet Sauvignon, 20% Malbec, 9% Cabernet Franc and 4% Petit Verdot. The wine, dark in colour, was aged 18 months in French oak. Once again, the winemaker has given a big role to Malbec in the blend. Aromas of black currant, vanilla and cherry jump from the glass, once again recalling good fruitcake. Firm in structure but with ripe tannins, the wine delivers flavours of black currant, espresso, dark chocolate on the palate. 90.
and aged just 10 months in 500-litre oak puncheons. No malolactic fermentation was allowed. The wine begins with toasty aromas (from time in the lees) mingled with hints of tangerine and apple. Those carry through in the flavours. The wine is almost creamy in texture, with a hint of oak on the long finish. This is a lovely and complex Chardonnay. 91. CedarCreek Platinum Desert Ridge Merlot 2012 ($34.79 for 550 cases). Aged 20 months in French oak, this is a bold and ripe Merlot. Dark in colour, it begins with aromas of black cherry, liquorice and spicy notes from very good oak. The wine is concentrated on the palate, with flavours of black cherry and black currant. It has ripe but firm tannins, with a structure to support another 10 years in the cellar. Decant the wine for drinking now. 92. CedarCreek Platinum Desert Ridge Meritage 2012 ($39.09 for 525 cases). This is 54% Merlot, 32% Cabernet Sauvignon, 7% Cabernet Franc, 4% Malbec and 3% Petit Verdot. The wine aged 20 months in French oak. Dramatic aromas of red fruit, tobacco and cedar spring from the glass. Savoury and spicy flavours of red currant, cherry and mulberry seduce the palate. The tannins are ripe and long, with enough firmness to give the wine longevity. 92. The release of its 2014 vintage wines is a landmark for Fort Berens Estate Winery: all the wines are from its vineyard in Lillooet. Fort Berens, of course, is the first and only winery (so far) in Lillooet. The winery was opened in 2009 by two Dutch immigrants, Rolf de Bruin and Heleen Pannekoek. They established the brand with wines made from Okanagan grapes, and made for the most part in Okanagan wineries. The 20-acre vineyard was planted in 2009, produced its first crop in 2011 and is now close to full production. Another 20 acres of vines are being, or will be, planted now that the terroir has proven itself. The wines are all made at Lillooet now. In the fall of 2013, Fort Berens opened a 9,500 square-foot winery that includes an elegant tasting room. It is safe to say this is the grandest structure in Lillooet. It is situated on the site of an 1850s Hudson’s Bay trading post from which the winery draws its name. The winery is marking the release of all-Lillooet grown wines with a six-week long contest. Contestants can enter between April 17 and May 31 at www.fortberens.ca or on the winery’s Facebook page. There will be weekly draws for winery prize package, leading to a grand prize valued at $1,000. The prize includes a winery dinner for four in the Fort Berens cellar with the winemaker. As well, the winner gets a year’s membership in the Fort Berens wine club. For those who can’t make the drive to Lillooet, the Fort Berens wines are widely available in wine shops and restaurants. One thing struck me when I read the specifications for these wines. The alcohol content of every wine is significantly more moderate (11% to 12.9%) than those of Okanagan wines. But the wines are not short of flavour. It seems that grapes ripen adequately during Lillooet’s blistering summers. Fort Berens Riesling 2014 ($15.99 for 1,145 cases). The wine begins with aromas of grapefruit and apples, leading to flavours of lime, apples and stone fruits, with a mineral backbone. The wine is exquisitely balanced so that it finishes dry. However, the 18 grams of residual sugar gives a lift both to the flavours and aroma and adds to a lingering finish. There is only 11% alcohol, so the wine is easy to drink. 90. Fort Berens Pinot Gris 2014 ($15.99 for 1,016 cases). This wine begins with delicate aromas of citrus, apples and spice. The flavours are expressively fruity, with notes of pear and fresh apple. A good spine of minerality adds to the backbone of this dry wine. Buy a few bottles and let some rest until summer when the flavours and aromas will be even more expressive. 89. Fort Berens Chardonnay 2014 ($17.99 for 966 cases). This wine was bottled a month ago and is not yet released. There is a very good wine here, beginning with subtle aromas of oak, vanilla, coconut and citrus. On the palate there are flavours of citrus and apple, along with a buttery note. The texture is rich, the wine having benefitted from 20% being fermented in barrel. Some 15% spent six months in French oak. The wine has good acidity that will enable this wine to age well, probably peaking in three years. 90. Fort Berens White Gold 2013 ($21.90 for 152 cases). This is the name Fort Berens gives to the best of its estate-grown Chardonnay. The wine was fermented and aged in French oak barrels. Only half the wine was allowed to undergo malolactic fermentation. The finished blend shows the buttery notes of ML but still has abundant fruit flavours and acidity. The aroma is rich and buttery, with notes of orange peel. On the palate, there are flavours of baked apple, tangerine, nuts and spice. The texture is generous and satisfying, giving way to a long finish. 91. Fort Berens Pinot Noir Rosé 2014 ($15.99 for 362 cases). The wine gets its lovely salmon pink hue from having had 48 hours skin contact. The wine has aromas of strawberries and raspberries, leading to flavours of raspberry and cranberry. There is an elusive note of earthiness on the crisp finish. The wine is dry. 87-88. Fort Berens Late Harvest Riesling 2014 ($17.99 for 390 cases of 375 ml bottles). Here is a delight. Aromas of lime, lemon and apricot just roar from the glass, setting you for an explosion of tropical flavours. This wine, with just eight per cent alcohol, has 75.7 grams of residual sweetness but this is nicely balanced with the acidity needed to give the wine a finish that is clean and refreshing. With a year or two of bottle age, the delicate honey notes just hinted at now will develop nicely. 92. Four years ago, Okanagan Crush Pad Winery was the first in British Columbia to install concrete eggs in its winery as fermentation and storage vessels. Today, most wines from OCP proclaim on the label that they have been “raised in concrete.” The winery is totally committed to using concrete. It now has 59,000 litres of concrete cooperage and no barrels – not even the used Opus One barrels employed to make 2012 Syrah. A few other producers have begun to use concrete but none has made such a major commitment to these vessels. This might strike some as a risky departure from tradition. Concrete, however, is as traditional a wine container as you can find. It was rediscovered for OCP by Alberto Antonini, the consulting winemaker from Tuscany who has worked with OCP since 2011. He had used concrete previously with other clients and at his family winery in Italy. His objection to concrete arose from unsanitary state of many old Italian wineries. This allowed concrete tanks to nurture spoilage bacteria. That is not an issue in a modern winery with good hygiene. Now, he can argue that concrete is the better environment. New Zealand-born winemaker Matt Dumayne (below) who joined OCP two years ago, has a long winemaking résumé. But this is his first time in a winery equipped with concrete eggs and tanks. Here are notes on current releases from OCP. 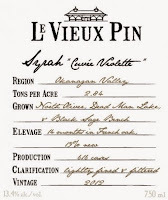 The Narrative label succeeds the winery’s Bartier & Scholefield label, discontinued with the departure of Michael Bartier to run his own winery. The prices are the tax-included prices prior to April 1. Narrative White 2013 ($18.90). This is a blend primarily of Chardonnay, Gewürztraminer and Pinot Blanc. The wine is fresh and crisp with flavours of apples and stone fruit, enhanced by the spiciness of the Gewurz. 90. Narrative Red 2013 ($19.90). This is primarily Gamay Noir with a dash of Syrah. It is a juicy, easy-drinking red with aromas and flavours of cherries. 88. Lunar New Year White 2013 ($19.90). The wine made only 100 cases of this, a blend of Gewürztraminer, Chardonnay and Viognier. A wine with a fat Alsace texture, it has spicy aromas that jump from the glass. On the palate, there are flavours of apples, stone fruit and spice. 88. Lunar New Year Red 2012 ($21.90 for 100 cases). This is primarily Syrah with a touch of Gamay. It begins with aromas of red fruit and white pepper, leading to flavours of black cherry with a hint of chocolate on the finish. 89. Haywire Canyonview Vineyard Chardonnay 2013 ($22.90 for 131 cases). Canyonview is an eight-acre Summerland area from which OCP has been buying premium quality Chardonnay and Pinot Noir grapes. This wine was fermented slowly in concrete with wild yeast. The wine has a bready aroma that comes from time on the lees. It has flavours of ripe apples and citrus. The wine is complex, with a dry finish. Having said that, I still like some oak on Chardonnay. 89. Haywire Free Form 2013 ($35.90 for 77 cases). Here is an edgy wine and an example of so-called natural winemaking. Chardonnay and Sauvignon Blanc grapes were destemmed into stainless steel tanks. The wine fermented with native yeasts. In addition to two daily punch-downs during fermentation, the wine remained in contact with the skins for eight months before being pressed. The result is a white wine for red wine drinkers. The lemon colour has a touch of haze (this is an unfiltered wine). The wine presents with a huge texture and with flavours of pineapple, tangerine, even strawberry. It is bone dry. 90. Haywire Switchback Vineyard Wild Ferment 2012 ($29.90 for 200 cases). The estate vineyard is planted entirely with Pinot Gris. That has been left off the label to draw more attention to the terroir. This is an intense and fleshy wine with vivid honeyed and fruity aromas, leading to flavours of pear and apple. 92. Haywire Switchback Vineyard Pinot Gris 2013 ($22.90 for 971 cases). This is a refreshing wine, with aromas of citrus and pears repeated in the flavours. There is a fine spine of minerality. On the palate, the wine opens with good weight, a textural plus from the concrete. 90. Haywire Gamay Noir Rosé 2013 ($24.90 for 136 cases). Fermentation and aging in concrete has added flesh to the texture of this dry rosé. The wine begins with aromas of strawberry and strawberry jam, leading to flavours of cherry and cranberry. 90-91. Haywire Canyonview Vineyard Pinot Noir 2012 ($39.90 for 515 cases). Dark in colour, this wine spent 18 months in concrete but had a few months in barrels beforehand. It begins with aromas of toasty oak and cherry, leading to bright flavours of red berries. 91. Haywire Canyonview Vineyard Pinot Noir 2013 (Not yet released; 500 cases). This is a bright and vibrant wine with aromas of raspberries leading to flavours of raspberry and cherry. Thanks to its concrete aging, the fruit shines with remarkable purity. This is a delicate but pretty wine. 91. Haywire Syrah 2012 ($24.90 for 312 cases). The grapes for this came from Saddle Ridge Vineyards on Black Sage Road, south of Oliver. The wine was aged on six-year-old barrels, which contributed to the textural feel without adding wood flavours. The wine has aromas of pepper and plum. On the palate, the spicy flavours recall Christmas fruitcake. 90. It is no secret that several bountiful harvests in the Okanagan and Similkameen have produced a lot of wine. How do you move it if you are a medium-sized winery? Church & State Wines hired Vancouver-based Brandever, the design firm run by Bernie Hadley-Beauregard. He has had many home runs since he created the name and the labels for Blasted Church Vineyards in 2002. He has also created a lot of quirky names. One of those that never made it, thankfully, was Dangling Carrot. The owners of that winery preferred Backyard Vineyards. Church & State’s new Lost Inhibitions labels are as edgy as they come, which seems to be just what winery owner Kim Pullen was looking for. The samples that came my way were a red called I’ve Never Felt More Classy and a white called Kiss Me Stupid. John Pullen, Church & State’s marketing manager, says there are a number of edgy labels for these wines … perhaps as many as 100. Those bottles with the more racy labels will be found in private wine stores, probably because government stores would not be caught dead with some labels (such as the one in the headline for this blog post). Provocative labels will sell a bottle once. Repeat sales depend on what is inside the bottle. Church & State has put good wines into these packages. I suspect these will appeal a critical younger demographic of wine consumers. There are consumers out there who are bored with varietal wines for no good reason except that everybody else was drinking them. Remember the Anything but Chardonnay crowd? Or the lingering negativity toward Merlot after it was slagged in the movie, Sideways? Perhaps you can pull those consumers in with good blends and far-out labels. We will know whether Brandever has hit another home run when we see patrons in the Cactus Club or Moxey’s enjoying Kiss Me Stupid. If it really works, consumers will then search out the more staidly labelled wines from Church & State. Here’s a hint: for the next special celebration, get a bottle of Quintessential, a $55 Meritage blend that is one of the best red wines in Canada. Here are my notes on the wines. Prices are approximate because the government’s new pricing regime is a bit hard to figure out. Lost Inhibitions Kiss Me Stupid 2014 ($18). This is a blend of 35.18% Viognier, 19.7% Gewürztraminer, 16.83% Sauvignon Blanc, 16.36% Chardonnay, 7.3% Riesling, 3.05% Orange Muscat and 1.58% Roussanne. You know that a winemaker with the patience to make such detailed measurements might also have the patience to make a good blend. This wine begins with aromas of herbs, spices and pears. On the rich palate, there are flavours of ripe apple, pears and apricots. The wine is dry with a lingering finish. 90. Lost Inhibitions I’ve Never Felt So Classy 2013 ($20 for 3,800 cases). This is 51.7% Merlot, 30.6% Cabernet Franc, 13.6% Malbec and 4.1% Petit Verdot. This is a delicious wine with flavours and aromas of cherry and blackberry, accentuated by hints of toasty oak and pepper. The soft tannins give this wine immediate approachability. 88. Since opening two years ago, 50th Parallel Estate has impressed many critics with its wines. This Lake Country winery is based on a young vineyard. It did not have a lot of wine to release from the 2011 vintage, its first. The current releases, from 2013 and 2014, show that the winery is ramping up production quickly as the vines mature. This can be illustrated with the flagship varietal, Pinot Noir. 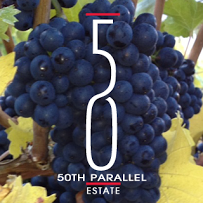 50th Parallel released 100 cases from 2011, 1,286 cases from 2012 and 2,145 cases from 2013 (along with 195 magnums). There is a comparable growth progression the other wines, with exception of Chardonnay. That variety was planted only after winemaker Grant Stanley joined the 50th Parallel partnership in 2013. The Chardonnay reviewed here is made with purchased grapes. I don’t know the grower but, judging from how excellent the wine is, I wonder if 50th Parallel might be tempted to keep those grapes in the mix after its own vines are producing. The winery’s public facilities have grown incrementally with production, from a tasting room that was little more than a plank over two barrels to a large and elegant one opening soon. Because the winery, near Carr’s Landing, might be perceived as being off the beaten path, the owners of 50th Parallel are developing it as a destination. The 10,000-square-foot winery opened last fall, with tasting facilities being augmented this summer. The winery’s website includes photographs and details about this facility, which has been designed by a leading Canadian architect. Future plans include food services and event facilities with great views over Okanagan Lake. The amenities will attract visitors and the wines will keep them coming back. 50th Parallel Gewürztraminer 2014 ($18 for 1,708 cases). This wine delivers explosions of tropical fruit in both the aroma and the palate. It begins with aromas of lychee, peach and spice, leading to flavours of lychee, honeydew, grapefruit and spice. The perceptible sweetness on the palate makes this a real crowd pleaser, especially as an aperitif. 89. 5oth Parallel Riesling 2014 ($18 for 577 cases). of minerals. The flavours show pristine focus, with notes of lime, lemon, apple and minerals. An exquisite balance of acidity and residual sweetness creates a tangy and refreshing finish. Buy more than one: this wine is too delicious to stop with just one bottle. 91. 50th Parallel Pinot Gris 2014 ($19 for 2,260 cases). The wine begins with alluring aromas of pears, apples and nectarines. It is a luscious fruit bomb on the palate, with flavours of apple, citrus, gooseberry and pear. It has a lingering finish that does not want to quit. Some of the complexity and weight here comes from fermenting 20% of the wine in three-year-old French oak. The other 80% was fermented cold in stainless steel tanks. The wine is delicious now but the winery recommends cellaring it up to five years. 90. 50th Parallel Chardonnay 2013 ($32 for 328 cases). This wine was fermented and aged 12 months in premium French oak barrels. The wine begins with a buttery and spicy aroma of expensive oak (think of cinnamon and apple pie). That translates to a creamy palate, with flavours of hazelnut, marmalade, baked apple and a never-ending finish. This is an elegant and satisfying Chardonnay. 92. 50th Parallel Pinot Noir Rosé 2014 ($18 for 803 cases). The salmon pink hue, dramatically displayed in a clear bottle with minimal labelling, comes from the 48 hours of cold soaking the juice on the skins after crushing. The wine begins with aromas of strawberry, raspberry and watermelon. On the palate, there are flavours of cherry and wild strawberry with a hint of Pink Lady apple. This light-bodied rosé has a crisp, dry and food-friendly finish. 88. 50th Parallel Pinot Noir 2013 ($32 for 2,145 cases and 195 magnums). The wine presents itself with a deep red hue. It has aromas of strawberry and blackberry with a suggested of toast. On the palate, it has flavours of strawberry, cherry, truffles and spice. Aged 12 months in French oak, the wine still has a slightly firm texture, but with hints the silkiness that will develop. This wine is built to cellar and is nowhere near its peak. The winery suggests cellaring up to 10 years. 92. Access to farmers’ markets for British Columbia wineries was one of the better changes in the recent overhaul of the province’s liquor regulations. Wineries began participating in those markets last fall, offering tastings and selling product. From the reports I have heard, this is generating valuable exposure and sales. That is not to say it is always operating well. Farmers’ markets in Nanaimo and James Bay on Vancouver Island are not allowing wineries to participate. It seems that the other market participants worry that wine sales will be done at the expense of the sales of other produce. That is an arguable proposition. Some markets also try segregating the wineries in an area separate from the other producers. Wineries would prefer to mix in with other producers, with visibility to all shoppers. They don’t want to be pigeon-holed into tasting rooms, if only because not many people are up to serious tastings early in the morning when the markets are busy. Having said that, the access to farm markets is valuable breakthrough that is appreciated by wineries. It is important to position wine as a farm product – and likely one that contributes farm more to the economy that some of the other products in the markets. Mark Simpson’s BC Wine Studio, which makes wine under the Siren’s Call brand (among other labels), is one of those wineries. BC Wine Studio’s production facility is on Oliver Ranch Road, south of Okanagan Falls. While there are plans for a wine shop, it is not open yet. Because Mark lives in Vancouver, he began showing his wines last year at the Vancouver Farmer’s Market. Its Hastings Park Farmers Market is run every Sunday at Hastings Park (the Pacific National Exhibition grounds). When the market re-opened for the season in March, Mark was there. Here are notes on some of the wines you might find at Mark’s table. Siren’s Call Viognier 2012 ($20). This is a ripe and luscious white with aromas of tropical fruits and with flavours of mango, apricot and ripe peach. The alcohol is 14.4% but the fruit flavours and texture are so lush that the alcohol is in balance. 89. Siren’s Call Harmonious 2011 ($29). This is a blend of 39% Merlot, 21% Cabernet Sauvignon, 16% Cabernet Franc, 14% Malbec, 8% Petit Verdot and 4% Syrah. This is a medium-bodied wine with bright aromas of cherry and vanilla leading to spicy black cherry flavours. The silky tannins make this wine appealing and approachable. 89. Siren’s Call Petit Verdot 2011 ($27). This wine is almost back in hue, which is characteristic of Petit Verdot. There is a dramatic aroma of plum, black cherry, chocolate and cedar, echoed in spicy flavours of black cherry, mulberry and plum. The wine is full on the palate and the finish lingers. 91. Siren’s Call Malbec 2012 ($27). The grapes for this vintage come from Manmohan Gill’s vineyard near Osoyoos. I note that to observe that Gill will be opening his own winery, called Bordertown Vineyards, this spring. As this wine proves, he is a good grower and he sold his grapes to a good winemaker in 2012. This wine begins with a lovely aroma of plums and cherries, leading to spicy red fruit flavours including cherry and black currant. With decanting, the firm texture becomes rich and generous. 90. Siren’s Call Pinot Noir 2012 ($22). This is a delicious wine with a full and silky texture. It begins with aromas of spicy cherry. This is echoed on the palate, along with a Burgundian earthiness on the finish. 90. Siren’s Call Syrah 2012 ($25). This big and bold red begins with aromas of black cherry, oak and delicatessen spices. On the palate, there is more black cherry and plum with classic notes of white and black pepper. 90.